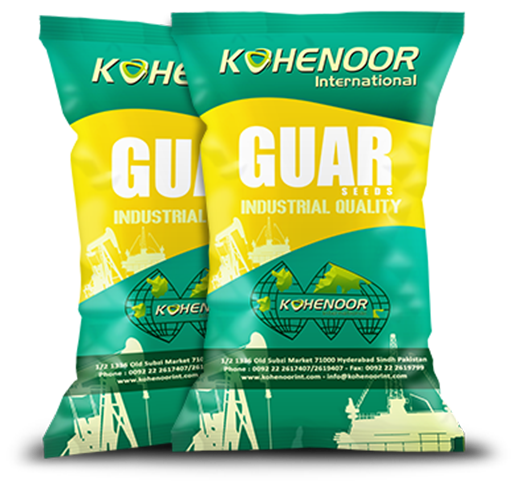 Kohenoor International is the leading supplier of Guar Seeds from Pakistan, and ISO 9001:2008 Certified company supplying premium quality Guar Seeds for producing high quality Gum for industrial use. Guar Gum has several Uses like in Food Industry it is a thickener and emulsifier in commercial food processing. It’s also use in Textiles, Pharmaceuticals, Cosmetics, Paper & Printing. Guar is known as a Natural Ingredient which is different from other common thickeners such as modified food starch and cellulose gum, Because Guar Provide lot of Important health Benefits. Guar gum is used in mining Potash, Copper , Gold and platinum group metals as a flocculent and as a depressant. Guar Gum has ability to competently thicken the nitrate salt solution which is elementary component of slurry explosive formulation. In Fish farming Guar use as binder in the fish feed pellets, the binder keeps the pellets from disintegrating promptly when sited in water and decrease the consumption of fish feed in fish ponds. Guar Gum used in the textile in printing thickener and a binder in the sizing of yarns. FOR MORE INFORMATION, PRICING AND ORDER ENQUIRY CLICK HERE! • Guar & Guar Gum uses in Food Industries. Guar Gums commonly uses in most of daily life foodstuff Products, it has some unique feathers which improve the handling and make the product smooth and increase the shelf life. It is also known as stabilizer and binding element in food processing industries. Guar Gum use in very large scale in Bakery industry in Cakes, Bread, Cookies, Pastry. guar Gum reduce batter mixing time and increase the shelf life of Product Because of gum's water absorption properties, and reduce the crumbling of cake. Due to its highly acidic emulsions it use in making the Sauces and ketchups, use in dressing of Salad. It is used in freezing desserts for its capability to survive freeze-thawing. Guar gum reduces the cholesterol and triglyceride levels but guar gum or other water-soluble.